Mothergunship should be a really fun game. It has everything that normally appeals to me in an arcade shooter: Its design is sharp and clean and its concept is smart. I thought I was going to lose hours to this game, I thought this game would be the shooter equivalent to Spelunky, but it wasn’t. Something in Mothergunship left me feeling cold, or perhaps it was something missing altogether. Mothergunship is a procedurally generated shooter with deep weapon customization. A lot of games have weapon customization but Mothergunship that’s the mechanic to a fundamental level. Weapons are made of three component parts: connectors, which make the shape of the gun, barrels, where the bullets come out, and caps, which offer some buffs. This can be arranged into whatever order you like and should allow you to build monstrous creations to excite and explode. But the early game is filled with low tier weaponry and plagued by a lack of power that makes your wilder creations untenable. For such a tenant of the game, one that was advertised before launch with a demo, it would be nicer to have a little more freedom to play with the toys provided. Its so tempting to build a huge contraption that fires rockets, bullets and spiked balls but you know its pointless. This is compounded by the punishment for failure. If you don’t manage to complete a mission, you lose all the parts you have. This means that the bigger experiments offer the biggest risk and you’ll feel more naturally inclined into play it safe and conserve your best equipment. This in itself wouldn’t be that disappointing, in fact, I could get the design behind it. Players would be teased by the possibilities of later game weaponry and keep pushing deeper into the game. But when the actual gunplay feels stale, I really struggled to keep coming back to it. When the game’s central premise is guns and the use thereof, you’d hope it would be enjoyable to wield them. 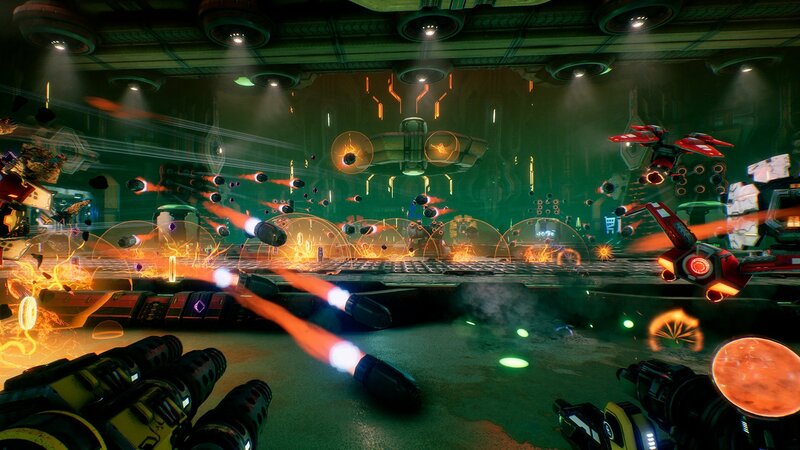 But alas, the weapons in Mothergunship feel limp and unaffecting in your hand and have no effect on the enemies. 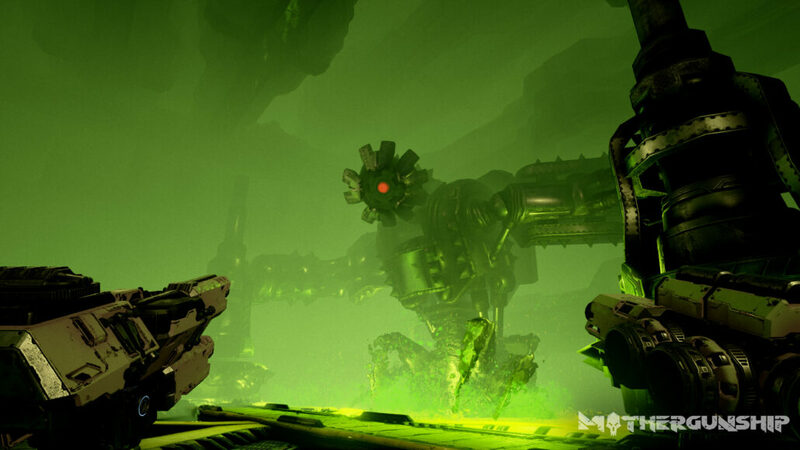 The enemies in Mothergunship are an almost impressive collection of robots, but they don’t react to fire in any meaningful, satisfying way. No matter what comes out of your weapon, and how of much it, there is no weight when you pull the trigger, nor any when it meets its mark. Some guns might knock you back, but your character is so light and floaty it’s hard to believe he wouldn’t be blown away by a light breeze. As the battles become more frantic and confusing, it can be hard to tell if you are actually making contact with anything. And this works both ways, with enemy fire doing absolutely nothing to you. Several times I died in Mothergunship without realizing I was being assaulted. While I normally appreciate a minimal HUD, I literally lost track of my health on more or less every game I played. The screen might be filled with gigantic explosions, dozens of enemies and plenty of traps, but without a bit of weight behind any of it, it’s just spectacle. Mothergunship is obviously inspired by Doom and other high octane shooters and leans heavily on high speed and constant movement. But while it might have a lovely clean design, the game itself feels remarkably cluttered. With so much happening on screen, it’s very difficult paying attention to where your feet are going. And if you’re not careful you can be caught on a lot of random level geometry, geometry that is pretty hard to spot. The story, such as it is, isn’t bad. There’s a couple of fully voiced characters that lead you through the self-aware, completely absurd plotline. It’s all a bit of a joke, and threads the familiar comedy sci-fi ground we’ve all seen, but I think I would have found it funnier if I hadn’t been so annoyed at the gameplay to pay attention. There are a lot of frustrations around Mothergunship for me, but perhaps it’s because I went in with higher expectations than I should have. Maybe someone who is aware of the faults, someone who wasn’t wrapped up in excitement can enjoy this game like I could not. But a lot of what I struggled with cannot be merely solved with positive thinking, like the weightless guns, and however heartbreaking it is, I cannot recommend Mothergunship. There are so many pick up and play games that don’t leave you feeling so cold when it looks like so much fun. Reviewed on PC (code provided by the publisher). You can purchase the game for PC via Green Man Gaming, for PlayStation 4 or Xbox One via Amazon. However fun it might look, some core parts of the game feel forgotten, abandoned or ignored. It's such a great concept and that makes it so sad it didn't even feel like a diamond in the rough.